There’s something about Tax Day that draws out our deepest insecurities. Far deeper than the stress of the deadline or the fear of filling out something incorrectly, it is a self-doubt borne of a feeling of not quite measuring up. The top one percent of earners in this country paid a whopping 37.3 percent of all federal income taxes…more than the 30.5 percent that the bottom 90 percent paid combined. Think about it: Our income tax return is nothing more than a year in our life measured in dollars. The sum total of everything we did is, at least in the eyes of the government, boiled down to the amount that we earned and the amount that we owe. Maybe I didn’t make as much as I felt I deserved; maybe I owed more than I felt I should. No wonder tax policy is so easy to emotionally manipulate. Democrats have become masters at this, convincing millions that they don’t make as much as they deserve and owe more than they should because someone else makes more but owes less. It is resentment politics, and it is remarkably effective because it preys on our innate insecurities and our tendency to express them by demonizing those we perceive as being more successful. Whether we want to or not, we tend to tie our feelings of self-worth to the numbers on our tax returns, and if we feel that we don’t add up, we also tend to try to rationalize. The most convenient goat is “the rich” or “the top one percent” – those nameless, faceless millionaires and billionaires who simply must be twiddling their mustaches, adjusting their monocles, and sneering at the rest of us as they hoard the money that should be rightfully ours. Democrats foster this delusion by constantly reminding us that “it’s the top one percent vs. the bottom 99 percent” and “the rich don’t pay their fair share.” So effective is this manipulation that it wholly obscures the truth – the rich don’t just pay their fair share. They pay everyone’s share. According to the Tax Foundation’s analysis of Tax Year 2016 data (the most recent available), the top one percent of earners in this country (who made at least $480,804) paid a whopping 37.3 percent of all federal income taxes…more than the 30.5 percent that the bottom 90 percent paid combined. In real numbers, the difference is even more striking. A total of 1.4 million tax returns (including individual and joint filers) that comprise the top one percent paid a total of $538 billion in federal income taxes. 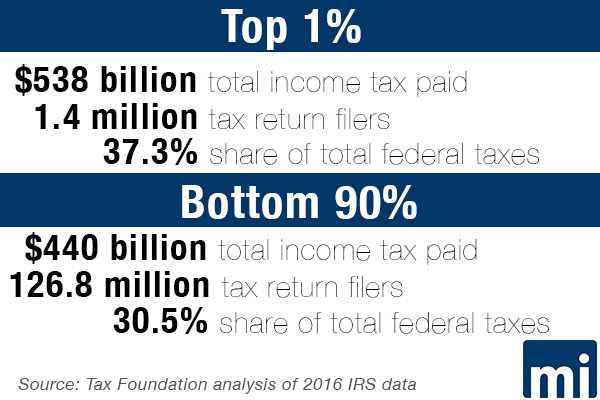 The bottom 90 percent, meanwhile, is comprised of 126.8 million returns that paid a total of $440 billion in taxes. In what way, exactly, aren’t the rich paying what they owe? Coincidentally enough, Democratic presidential candidate Bernie Sanders – the grandmaster of resentment politics – was forced to grudgingly admit on Tax Day that he is now in the very same “top one percent” that he has spent the past 30 years railing against. By Sanders’ own logic, the Republican Party works only for the hated millionaires and billionaires (except for him, of course) while his Democratic Socialist movement stands up for the poor and the middle class. So does everyone else. The difference between Sanders and his fellow Democrats and Republicans, though, is that while Democrats are content to punish wealth by confiscating it from those in the highest tax brackets, Republicans try to get everyone in a higher tax bracket. If that sounds simplistic, consider this. By Sanders’ own logic, the Republican Party works only for the hated millionaires and billionaires (except for him, of course) while his Democratic Socialist movement stands up for the poor and the middle class. Shouldn’t the Republican Party then want to create as many millionaires and billionaires as possible so as to expand their voter base? And if the rich and successful are Democratic Socialism’s sworn enemy, then why would a politician like Sanders enact policy that would enrich more people and thus make them more likely to vote Republican? Seen through this prism, it’s obvious why liberals like Sanders have gotten so good at the politics of resentment: Pure necessity. If voters stop believing that the rich don’t pay enough in taxes, they might start blaming the Democrats whose policies invariably lead to higher tax rates for everyone.